Goodbye, snow — hello, sunshine! It’s time for mid-winter break and we’re escaping the frozen tundra of Michigan for instant spring in Florida and the Bahamas. 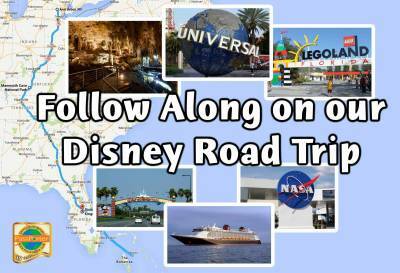 Follow along as we take a Great American Road Trip to the south, stopping along the way at Mammoth Cave in Kentucky and visiting Walt Disney World, Universal Orlando, LEGOLAND, and Kennedy Space Center. Then we’ll give our car a rest as we board the Disney Dream for a 4-night Bahamas cruise before heading back north. 1. Music – Make a play list of music, podcasts, and audiobooks on your phone or iPod to listen to when you go through boring radio station zones. One of my all-time favorite set of songs for a Disney road trip is the Cars album. Life is a Highway! 2. Snacks – Visit the grocery store and get yummy, healthy snacks and drinks at decent prices in advance rather than rely on the junk you find in gas stations. Plus, then you have it when you need it. Oh, and I recommend clear liquids for the kids. Alexander does still spill his drinks from time to time! 3. Maps – Map out your route in advance on your phone or GPS. But don’t rely on just your phone or GPS. I still print out a simple route from Google Maps and stash it in my car, just in case I have bad reception or a phone that I forgot to charge. 4. Power – Make sure you’ve got enough chargers in your phone to keep all your devices charged while you’re driving, and make sure you test them before you leave! I also like to have a battery converter in my car in case I need to charge things like laptops or Nintendo DSs. 5. Entertainment – When Alexander was young, I had to focus more on keeping him entertained. I used a combination of paper-based activities, movies, and games that we played in the car. These days, as a road-hardened traveler, he pretty much entertains himself either on the iPad or just by looking out the window. I am helping things out, however, by downloading a couple of movies to my iPad. I’m also making him a Disney Surprise Bag with little activities and other things he likes, and he’ll earn them as we drive along to give him something to look forward to. 6. Luggage – I like to pack my stuff for a road trip the same way I pack for a flight , using regular wheeled suitcases that hold the things I really need. That’s because it makes it a lot easier to get in and out of hotels. And on this trip, I’ll be staying in seven different hotels, so it’s important that I can move in and out without a lot of fuss. Avoid the temptation to just use your car as some sort of big suitcase! I make two exceptions to this rule: The first is that I always pack blankets and pillows in the car — they are so nice to have on a road trip and you can just leave them in the car. The second is I like to have a separate overnight bag just for those motel stays during the trip — something I can grab quickly when I have to stop at night to sleep and help a sleepy kid navigate into the room. 7. Emergency Kit – Always take a road emergency kit with you, just in case. In addition to the usual car stuff, I also add in a first aid kit and cleaning supplies (trash bags and disinfectant wipes, because, spills!) I also recommend a roadside assistance service. I love AAA. I’ve been a member for something like 20 years now and it’s so worth it to me because I inevitably need a few jumpstarts each year after we left a door open. And AAA will help when you’re driving a rental, too. Some rental companies offer roadside assistance, too. And don’t forget — pack the car the day before you leave. It is much less stressful and it’s fun to just wake up, take a shower, and hop in the car for your adventure. Remember, if you have requests for photos or videos on our trip, let us know! Great tips….snacks and the blankets also come in handy if you get stranded!